Quilts have always kept us warm, reminded us of our past, and brought families and friends together. These same ideals are used to create the Elkins Main Street’s Heritage Quilt Trail. A community supported effort to bring art, history and warmth to downtown Elkins. With guidance from Elkins Main Street and their Promotion Committee, small groups of community volunteers, such as Emma Scott Garden Club, Davis & Elkins College ladies lacrosse team, Youth Build North Central and Appalachian Forest Heritage Area AmeriCorps members, are creating more quilt blocks for instillation on several downtown Elkins buildings this fall. The Heritage Quilt Trail began in 2015 with members of the Main Street Promotion Committee discussing how the brightly colored panels could spark a grass roots beautification effort. With information gathered from the Pocahontas County and Monroe County W.Va. quilt trails the committee set out to make their own quit trail. Quilt panels like the one above are created with grant funds and project proceeds received by the Elkins Main Street office. The funds are used to purchase the construction materials and paint needed to make the 4, 8’ X 8’ft panels. Money gained from the sale of the quilt block panels in turn pays for the creation of more panels in smaller sizes. The current plan includes making 12 panels of three different sizes. The images used to create the quilt block panels are copied from traditional Appalachian quilts. They represent things that a family from the mountains would see or use every day. The patterns are often designed after nature. 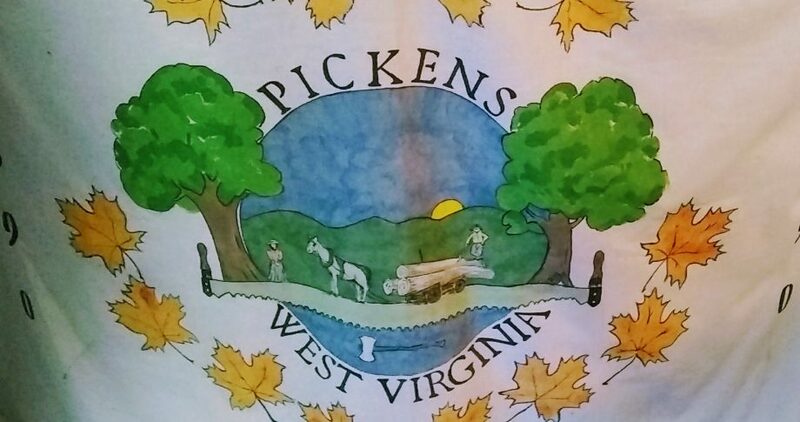 Leaves, animals and trees are the most often found subjects in West Virginia quilts, but other patterns like baskets, houses, and stars are also popular. Often families would use remnant materials from old clothing and sewing projects to make the quilts. Mixing materials and colors made each quilt unique and cherished by the owner. A single quilt block panel will often take over a month to make, from design ideas, to painting, to an installed product. The Heritage Quilt Trail panels have approximately 15 different volunteers’ handy work as part of their finished product and installation. This part of the process is also reminiscent of the traditional creation of fabric quilts. In days past, friends and family would gather for quilting bees, but today Elkins Main Street hosts painting parties, where people from the community come together to get to know one another and take part in community art. AmeriCorps Members Molly Greenhouse, Dominic Piacentini , JoLynn Powers (project coordinator) and Katie Marie Simmons add tape pattern to the 8 x 8 ft. panel. It takes a diverse group of volunteers to make the Heritage Quilt trail possible, and it brings a community together to enjoy them. With the future creation and installation of all 12 panels, the Main Street Promotion Committee hopes to publish a Heritage Quilt Trail Map. The map/ brochure will give the location of the quilt block panels, a description of the images used and information about the history of quilting in Appalachia. Elkins Main Street hopes to give visitors another interesting reason to linger in the downtown and take time to enjoy the beauty of Elkins. “West Virginia Star” installed at the Davis Trust Company Bank, Elkins W.Va.